Laura Emma Robbins, 90, formerly of Oak Ridge, passed away Saturday, December 1, 2018 at the Johnson City Medical Center in Johnson City, TN. She was born December 24, 1927 in Algiers, Louisiana, the daughter of Robert Dewey Williams and Odessa Corina Larsen Williams. Mrs. Robbins served with the US Navy from 1950 – 1952. She was a registered nurse and retired from the Oak Ridge Hospital. 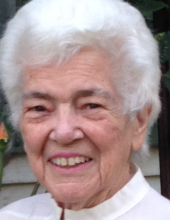 She was a member of St. Mary’s Catholic Church and active with the Catholic Women’s Club and the Church Women United. Mrs. Robbins had also been active with the Oak Ridge Historical Society. She enjoyed her monthly lunches with other retired nurses and taking part in swimming and water exercises twice a week. In addition to her parents, she was preceded in death by husband J. M. Robbins, April 13, 2006. She is survived by 4 sons, Raymond Randell Robbins and wife Kathi of Bristol, TN, Michael Duane Robbins and wife Rhonda of Jenson Beach, FL, Thomas Dewey Robbins and wife Nancy of Albuquerque, NM and John Michael Robbins and wife Heather of Layton, UT; Daughter, Laura LaNelle Byrd of Johnson City, TN; Sister, Peggy Jane Clements of Houston, TX; 9 grandchildren, April Dawn Gilbreath, Angela Michelle Shelby and husband Matt, Robert Britton Byrd and wife Ellie, John James Byrd and wife Rachelle, Billy Ray Byrd and wife Chelsea, Jacob Christian Robbins, Emma Grace Robbins, Christian Thomas Robbins and Sarah Elizabeth Robbins; and 12 Great-Grandchildren, Jacob Gilbreath, Jocelyn Gilbreath, Ella Byrd, Evie Byrd, Eliza Byrd, Noel Byrd, Michelle Byrd, Daniel Byrd, Hannah Byrd, Athens Shelby, Aaliyah Shelby and Cannon Byrd. The family will receive friends on Tuesday, December 4, 2018 from 6 – 8pm at Weatherford Mortuary. A funeral mass will be held on Wednesday at 11am at St. Mary’s Catholic Church with Father, Peter Iorio officiating. Interment will follow at Oak Ridge Memorial Park. The family asks that any memorials be in the forms of contributions to St. Mary’s Catholic School. An on-line guestbook can be signed at www.weatherfordmortuary. To send flowers or a remembrance gift to the family of Laura Emma Robbins, please visit our Tribute Store. Meet at the cemetery in the Garden of Valor immediately following the Funeral Mass. "Email Address" would like to share the life celebration of Laura Emma Robbins. Click on the "link" to go to share a favorite memory or leave a condolence message for the family.